Alastair Willis conducts the Florida Orchestra through a stirring rendition of The Italian Girl in Algiers during a coffee concert. 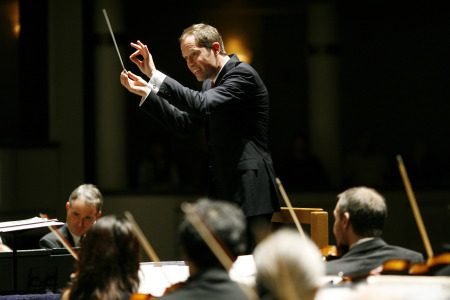 ST. PETERSBURG � Conductor Alastair Willis' schedule is full. After leading Thursday's coffee concert with the Florida Orchestra, he's got performances to conduct in Washington state, Germany and Canada through December and most of January, but he just happens to have Jan. 31 off. Good thing: That's the night of the Grammy Awards, and Willis is up for one. A concert version of Ravel's opera L'enfant et Les Sortileges (Naxos), performed by the Nashville Symphony Orchestra and conducted by Willis, received a nomination in the category of best classical album. "It came out of the blue. Totally shocked. Totally honored,'' Willis said, interviewed before the orchestra's morning concert at Mahaffey Theater. Willis, who plans to attend the Grammy ceremonies in Los Angeles, probably won't be seen on the CBS telecast, which will lavish its attention on pop stars like Beyonce, Taylor Swift and Lady Gaga. The classical awards are usually given off the air. But he's still among august company. The other nominees for best classical album are Bernstein's Mass , performed by the Baltimore Symphony Orchestra, conducted by Marin Alsop; Mahler's Symphony No. 8 and Adagio from Symphony No. 10, performed by the San Francisco Symphony, conducted by Michael Tilson Thomas; Ravel's Daphnis et Chloe , performed by the Boston Symphony, conducted by James Levine; and Shostakovich's The Nose , performed by the Orchestra of the Mariinsky Theatre, conducted by Valery Gergiev. Willis is in his second season conducting the orchestra coffee series, and the morning concerts of light classics are as popular as ever. For Thursday's concert of orchestra music from operas, featuring principal flute Clay Ellerbroek in the Carmen Fantasy , Mahaffey was virtually full. "There's nothing like going out and seeing a packed house,'' said Willis, a gangly, boyish figure whose clear conducting technique drew a fine, nuanced performance from the orchestra. His remarks between numbers from the podium were witty and established good audience rapport. "Now we're going to play a three-hour opera in 10 minutes,'' he said, describing an arrangement of excerpts from La Boheme . Willis, 38, was born in Massachusetts and spent much of his youth in England (he speaks with an English accent). His older sister, Sarah, plays French horn in the Berlin Philharmonic, which also released a CD this year of L'enfant et Les Sortileges , conducted by its distinguished music director, Simon Rattle. As the reviews posted on Willis' Web site (alastairwillis.com) indicate, quite a few critics preferred his interpretation over Rattle's.